This past year has had its fair share of ups and downs. I've been through a loooooot and while I cannot really eloquently put it into words on the internet, I can say that it's changed me. There were many a nights when I would cry out and ask God why I was in this situation (in fact, if you go through my blog, you'll probably think I'm a whiny blogger). I wondered why I was undergoing so much and I honestly was losing hope that the end was and could be in sight. But I've also learned a lot about myself. And now that I have a new job lined up, I've realized that while it wasn't an enjoyable experience, it was a growing experience. And that change changed me. Change, despite its pain and hardships, changes me. A wise co-worker told me multiple times this year that it's the times that are the hardest that keep you growing. And that it's all about perspective. And I'm grateful for the wisdom she instilled in me. I have learned a lot. About myself as a person, as a teacher, and as a Jesus-follower. I've learned that God's plans are perfect. That He never leaves me, never deserts me, and ALWAYS forgives me. I've learned that I'm a lot tougher than I ever thought. I may tear up at the sappiest of commercials, but I've got a lot more strength (aka I've got HIM) than I ever thought. I've learned that teaching is a blessing. It's not just a job, not just a money-maker or career. It's tough work that is filled with surprises. But it's so very, very, very fulfilling and something I now know I need in my life. 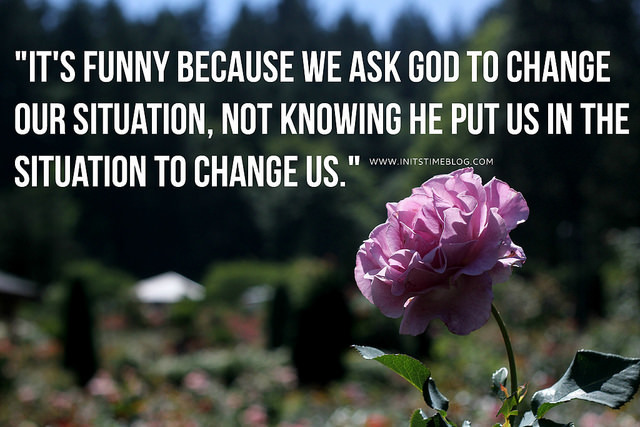 So if you're undergoing change right now, I get it. Trust me, I do. It's tough and I never want to dismiss that fact. But you can do it. And I don't want you to quit. Because I know you'll make it through. Kiki, you know I can definitely relate to what you've been going through this year. I feel the same way about this past year in that it was really really challenging...but God changed me through it. I love that God has been working in you, and I'm not surprised at all that He has provided a new job for you. He never ever fails, does He? Talk about going through change at the moment, wow. My whole entire world is upside down right now but God strengthens and sharpens us through changes and He is always there through the growing pains. Love this post Kiki! Oh girl, I am so grateful that while we both had a crazy year, it all ended up with changes--for the good! I am so excited that we both get to embark on new teaching adventures and I cannot wait to hear more about your new job. You have no idea how much of a smile you brought to my face this morning. Not because you're undergoing changes and tough times (sorry to hear that, by the way!) but because it reminds me that even though I may feel like I'm alone, I not only have God but have friends like you to remind me that I'm never alone--which means a lot as an introvert! Exactly, Finley! While these tough times are hard, they're also a great way for me to remember just how amazing God's timing and plans are. Change while hard, can definitely be good. Amen to that!